Find all of the amazing projects from The Artist Tribe in one place! Click on any of the images below to go to the original posts where you can see more photos, project details, and even a few tutorials! 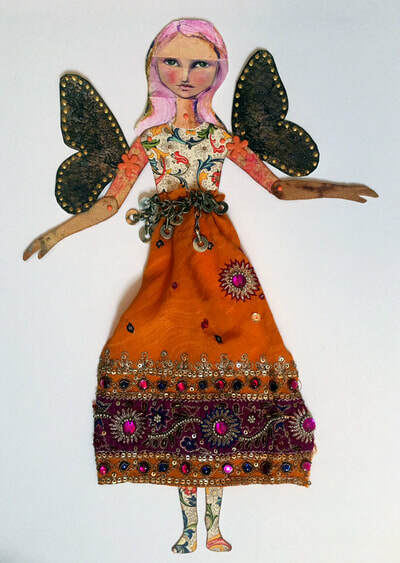 Loving this scrap fairy paper doll by Linda Edkins Wyatt - click to see how she used Florentine paper, sari scraps, and Turkmen jewelry parts to make this fab art doll! 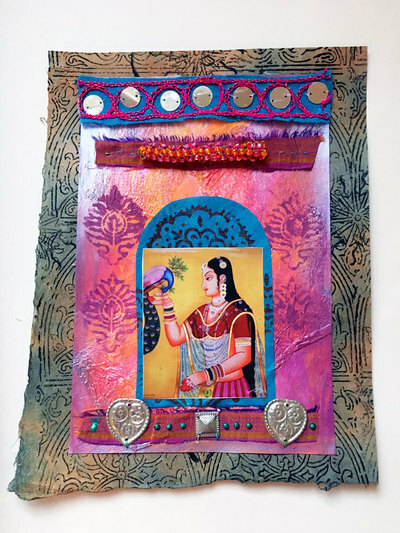 Lynda Shoup shared this beautiful global inspired art journal page with hand-printed papers, stenciling, jewelry parts, and sari scraps. Click for details! 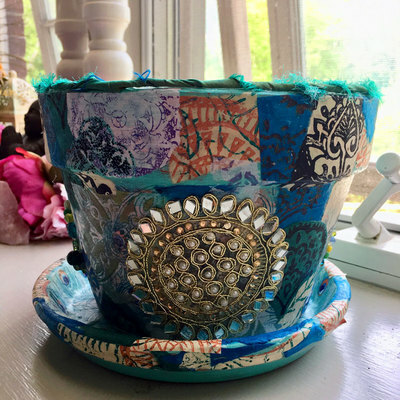 Lynda Shoup used a sari patch and hand-printed and stenciled papers to make this fabulous boho chic flower pot! 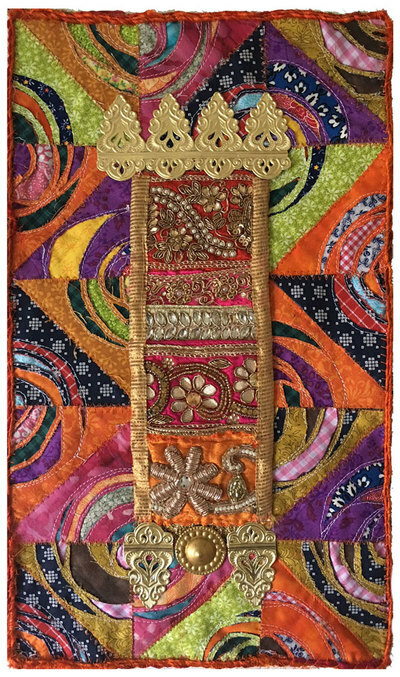 This medieval inspired art quilt by Linda Edkins Wyatt features patchwork sari trims, Dresden, jewelry parts, and more. Click for details! 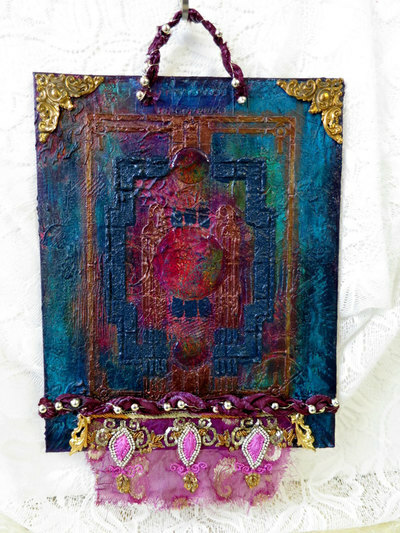 Jackie Neal used sari scraps, papers, and Turkmen jewelry parts to create this gorgeous art journal page. Click to see the full spread plus lots of close-up details! 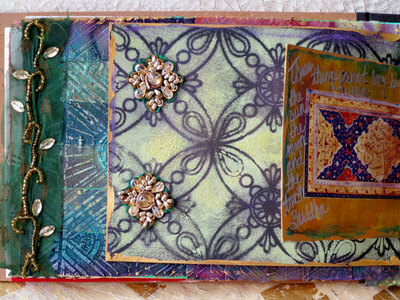 See how Jill McDowell used some of my new Spring stencil designs in this beautiful art journal page! 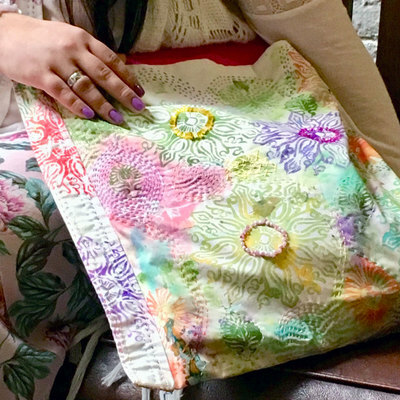 See how Lynda Shoup made this handmade bag using some of my stencil designs and boro stitching techniques. 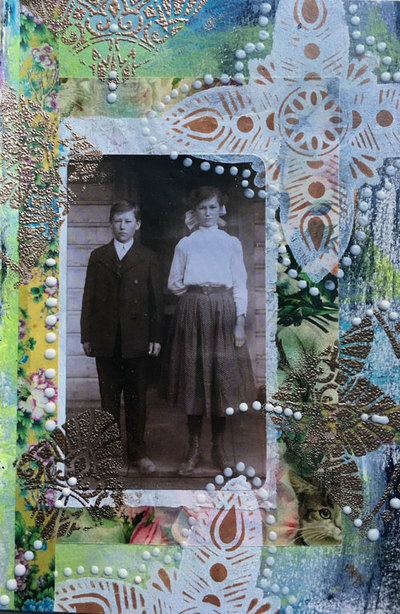 Click to see how Linda Edkins Wyatt applied rust techniques and embossing powder to two beautiful art journal pages using vintage photos. 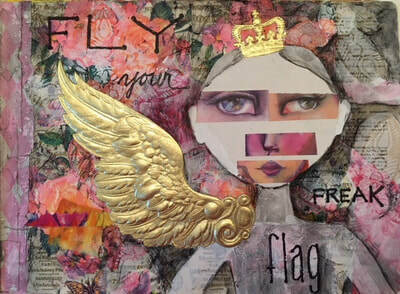 Jill McDowell started this gorgeous mixed media canvas in a class she took with me in St. Louis. Click to see close-ups plus get a class recap! 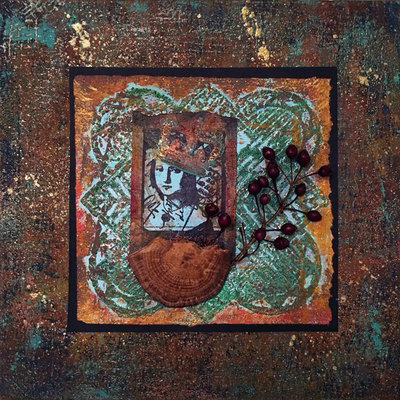 Click to see how Linda Edkins Wyatt used stencils and Turkmen jewelry parts on this beautiful mixed media artwork! 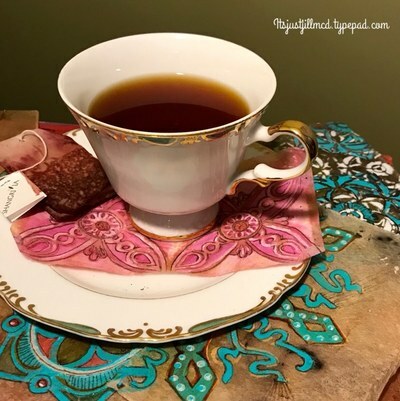 See how Jill McDowell upcycled teabags into fabulous stenciled mixed media art! 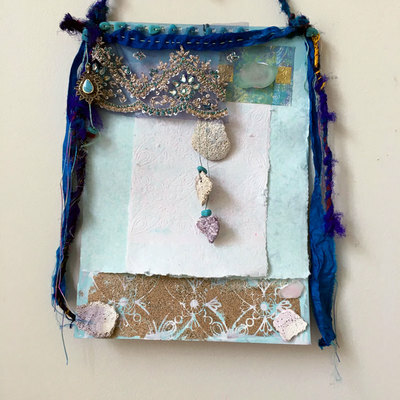 See how Lynda Shoup made this mixed media wall hanging with stencils, sari scraps, handmade paper, and more. 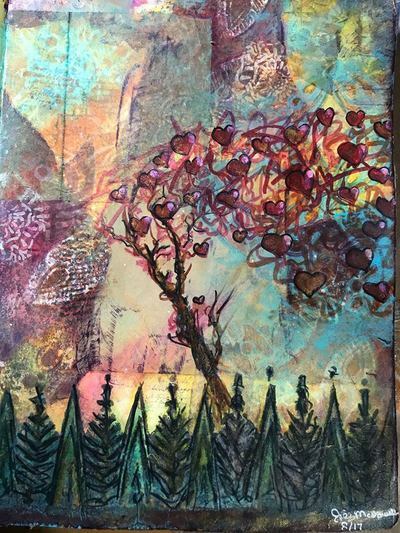 See how Jackie Neal used stencils, sari scraps, Turkmen jewelry, and more to chronicle her art journey in her art journal. 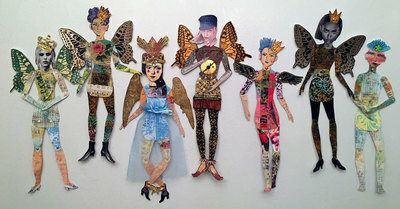 Linda Edkins Wyatt made these fabulous mixed media art dolls - click to see all the details and closeups! 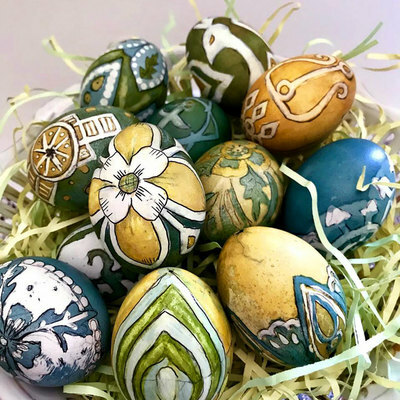 Jill McDowell has a full tutorial showing how to make these fabulous stenciled eggs, including how to blow them and make the natural dies! Click for details. 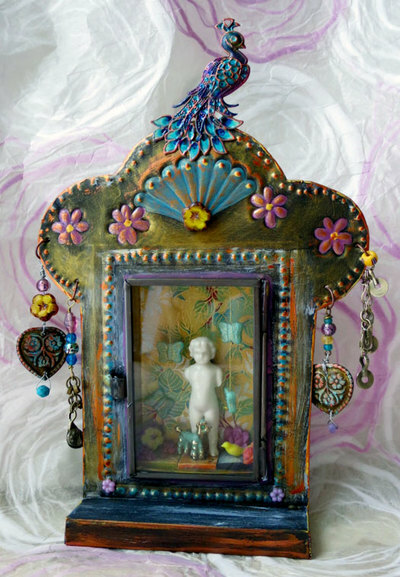 Jackie Neal used one of the small handmade Mexican nichos with Turkmen jewelry parts and a brass peacock finding for this stunning shrine. Click for details! 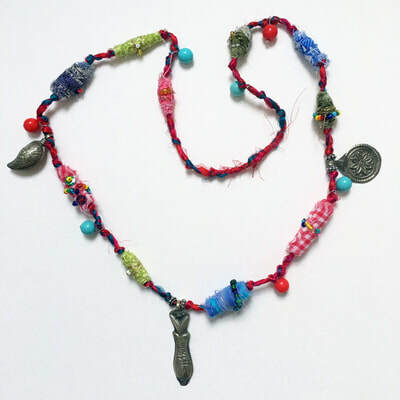 Click to see how Linda Edkins Wyatt created this fabulous boho necklace with handmade fabric beads, sari yarn, and Turkmen jewelry parts! 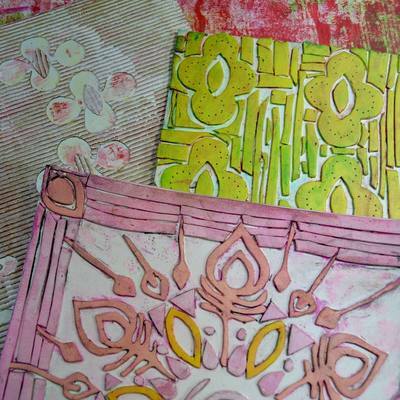 See how Jill McDowell made her own collograph plates using stencils and fun foam! 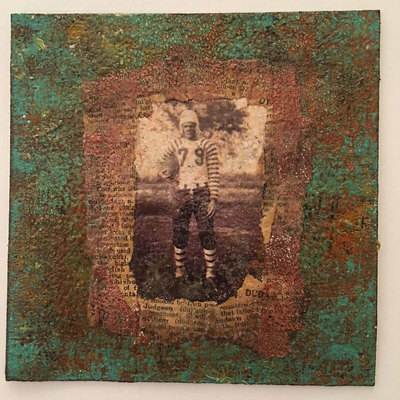 Click to see Linda Edkins Wyatt's post showing how she made this delightfully rusty and stenciled mixed media piece! 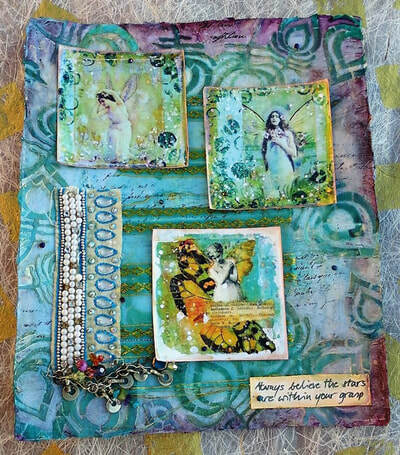 Jackie Neal has more fabulous art journal pages with sari scraps and stencils - click for details on this and even more pages! 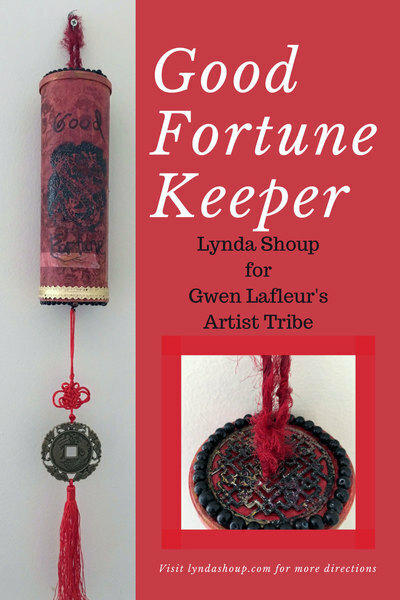 See how Lynda Shoup upcycled an old container into a mixed media fortune keeper for Chinese New Year! 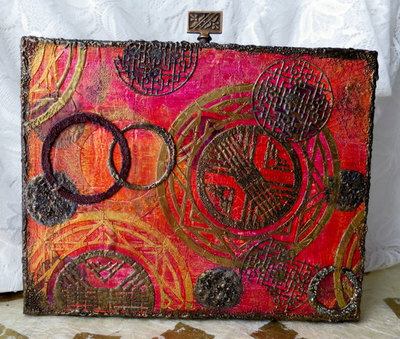 Jackie Neal shows some fabulous examples of how she used embellished sari scraps and stencils in her art journal. Click to see more! 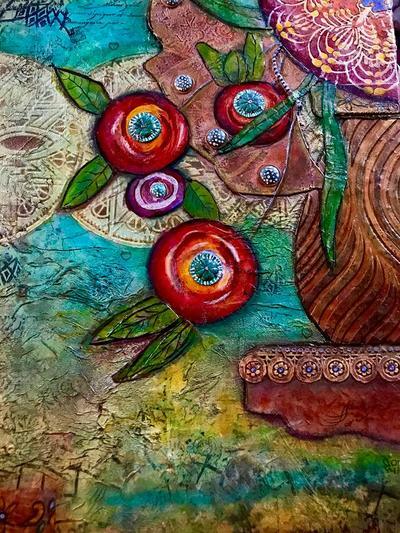 Sandee Setliff walks through a brilliant re-work of this mixed media panel that uses paper, embossing powder, and paint. Click for details! 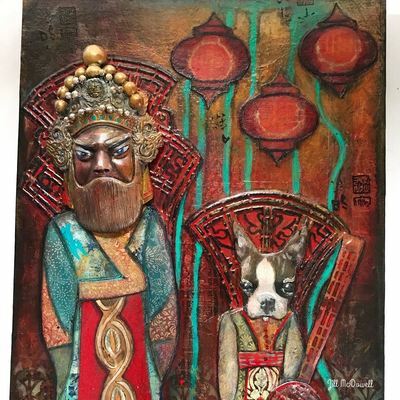 Click to see how Jill McDowell used a resin Peking Opera mask as a focal point on this stunning Chinese New Year themed mixed media panel! 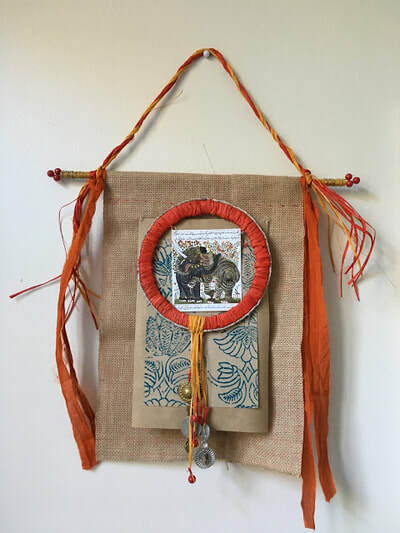 See how Lynda Shoup made this Chinese New Year themed mixed media wall hanging! 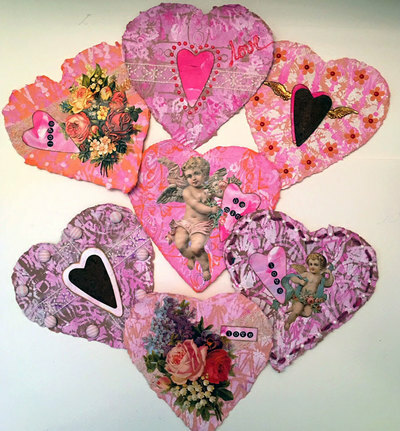 See how Linda Edkins Wyatt used stencils, Dresden, and English scrap with the cotton rag hearts from the shop to make gorgeous handmade Valentines! 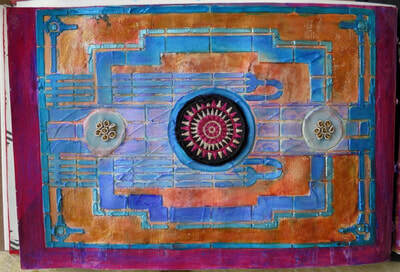 Jackie Neal blended diecuts, stenciling, and paint for a beautiful Asian - Art Deco Fusion mixed media panel. Click for more details from this project! 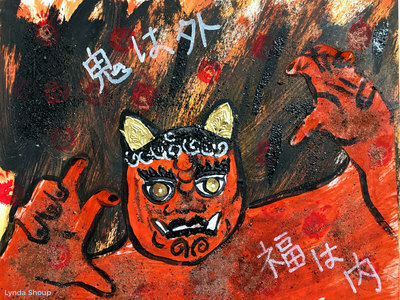 See how Lynda Shoup used embossing powder and stencils to make this mixed media piece celebrating Setsubun! 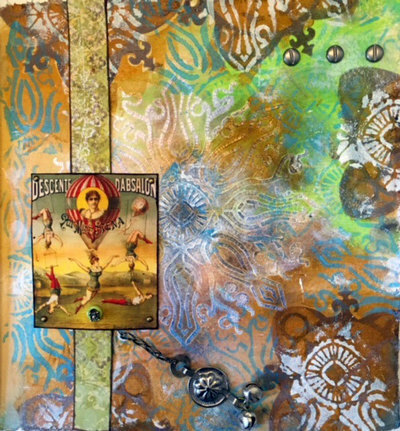 Jackie Neal used my Art Deco Bookplates stencil along with sari scraps and Baked Texture embossing powder in Deep Sea to make this stunning mixed media wall hanging. Click for details! 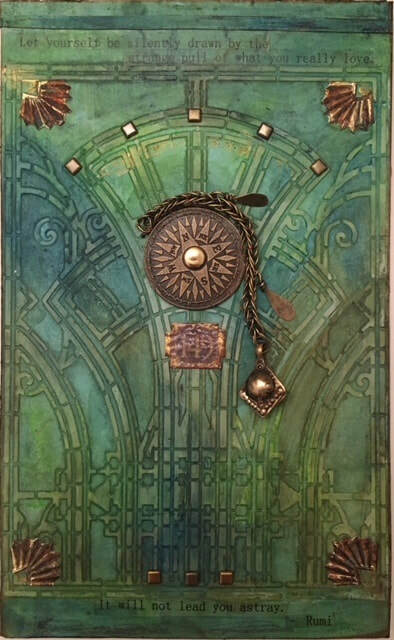 Linda Edkins Wyatt used my stencils, washi tape, and Emerald Creek embossing powder to make this beautifully layered art journal page. 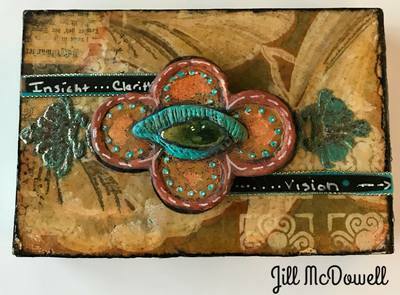 Jill McDowell used my Ornamental Circle Cluster stencil with Baked Texture embossing powder and collage for this fabulous mini mixed media panel. Click for details! 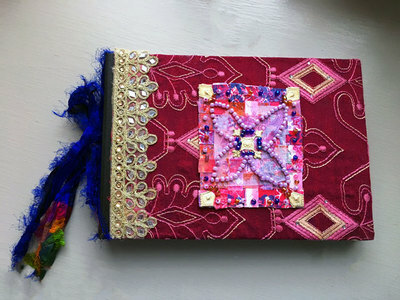 Lynda Shoup decorated the covers of an art journal to use as a friendship book using sari yarn, trims, and fabric scraps and some of my stencil designs. Click for details! 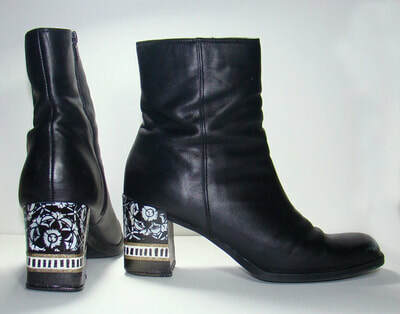 Click to see how Sandee Setliff used a stencil and some embossing powder to give new life to an old pair of boots! 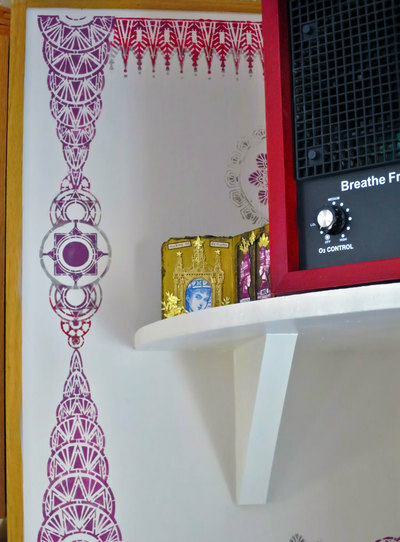 Jackie Neal used some of my Art Deco stencils in this fabulous home decorating project! Check her blog for details. 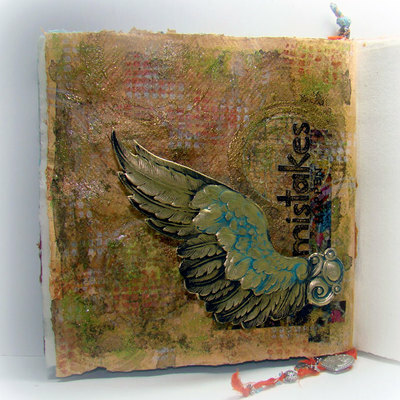 Linda Edkins Wyatt made this lovely art journal page with a fabulous stenciled background. Click for details. 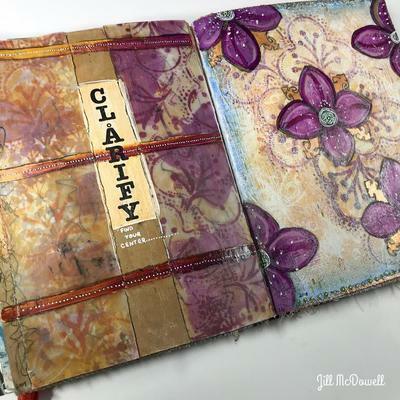 Jill McDowell used stencils and matte medium to make a fabulous art journal spread with acrylic skins to showcase her word of the year. 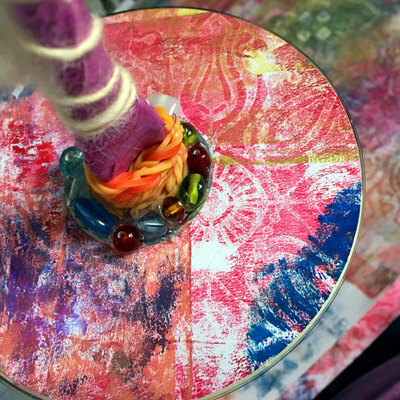 See how Lynda Shoup used stencils, sari yarn, and beads to upcycle an old CD into a spindle for her hand-spun yarn! 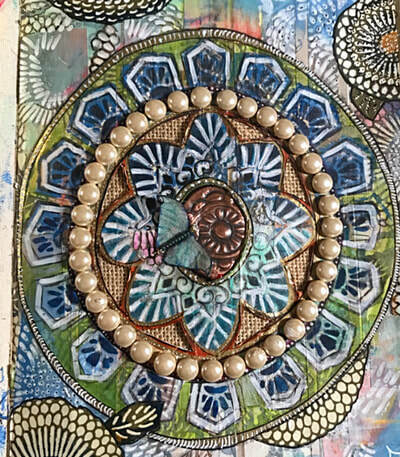 Click for all of the details of this art journaling page by Sandee Setliff using Dresden, washi tape, embossing powder, and more! 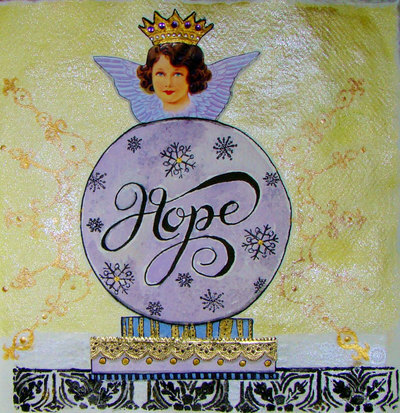 Jackie Neal used Dresden trim and shapes in a variety of ways with stamped faces for cool mixed media effects. Click for the full post! 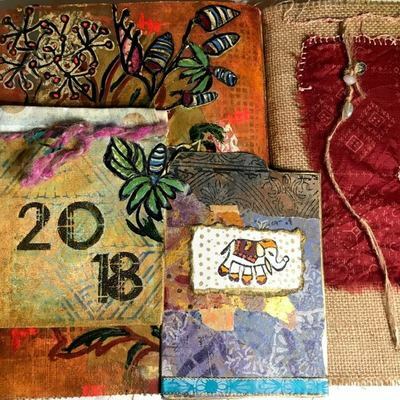 Sandee Setliff used Dresden, English Scrap, and some of my stencil designs for this art journal page sharing her word of the year for 2018. Click for details! Jill McDowell used some of her own hand-carved stamps along with some of my stencil designs to create fabulous pockets for her art journal. 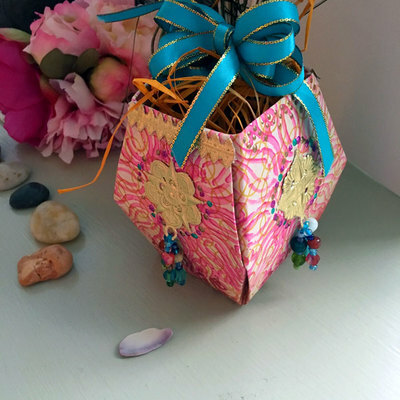 Lynda Shoup made this fabulous boho style stenciled vase out of paper and Dresden trim! Click to see her post and all of the details. 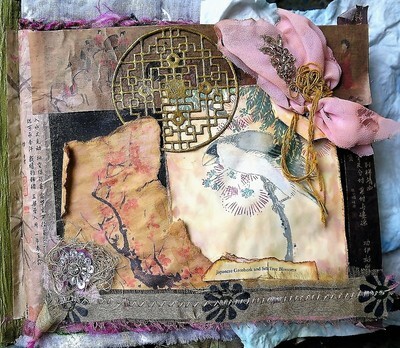 Linda Edkins Wyatt used Dresden trim and my Ornamental Petals Mask on this fabulous art journal page. Click for more details about her project! 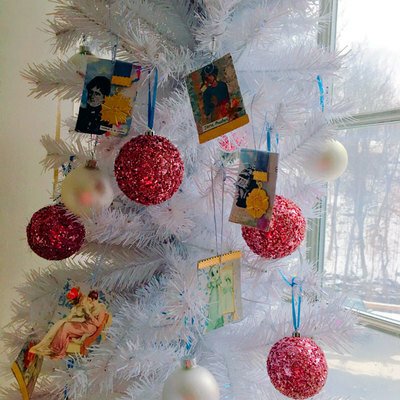 Lynda Shoup is celebrating Jane Austen with these fabulous DIY Christmas ornaments made with Dresden trim. Click for her post with close-ups and explanations for each one of them! 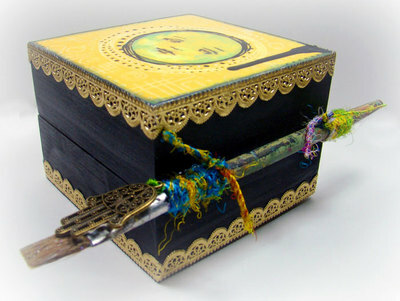 Sandee Setliff used Dresden trim, sari yarn, and a bronze Hamsa charm to accessorize the outside of this artist box. Click to see her post and the inside using English scrap! 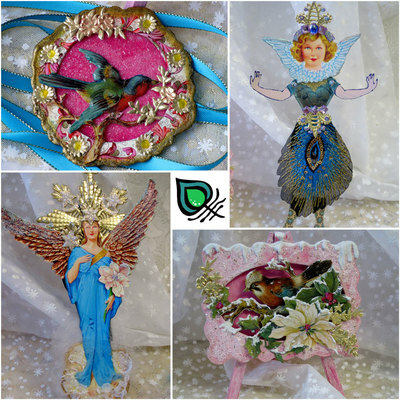 Jackie Neal used Dresden Trim along with some German and English Scrap and a peacock feather applique to make these unique mixed media Christmas ornaments! Click for her post with more details. 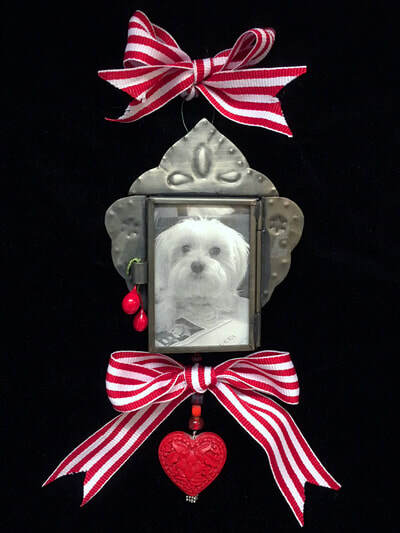 I love the way Linda Edkins Wyatt used one of the small handmade Mexican nichos to make this beautiful DIY keepsake Christmas ornament! Click to see more about her process. 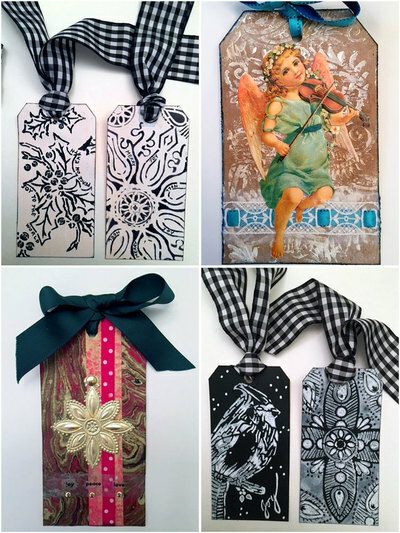 Linda Edkins Wyatt used stencils, scrap sheets, and Dresden trim to make these gorgeous DIY holiday gift tags. Click for her post with more photos and details! 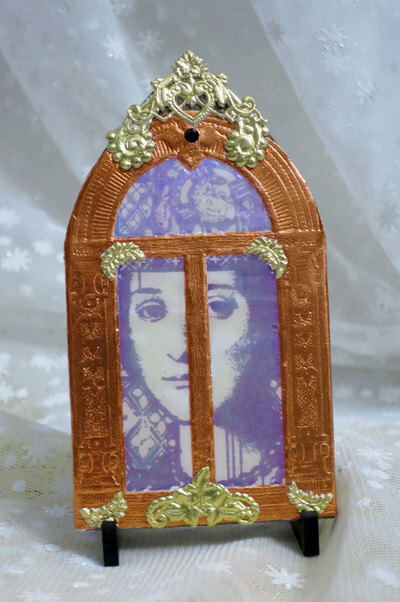 Jill McDowell made this stunning mixed media panel using an altered book, Dresden trim, and my Decorative Filigree Ornament stencil. Click for more photos and details! Lynda Shoup used my Christmas stencils to make DIY holiday gift boxes in three different styles. Click to see details! 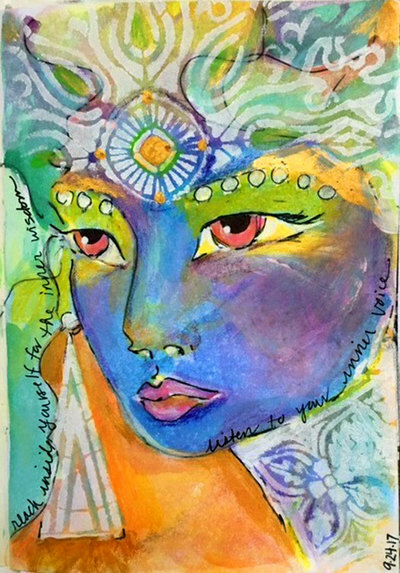 Linda Edkins Wyatt is doing some gorgeous art journaling using a few of my stencil designs to create the structure of her portrait. Click to check out her blog post for more details and photos! 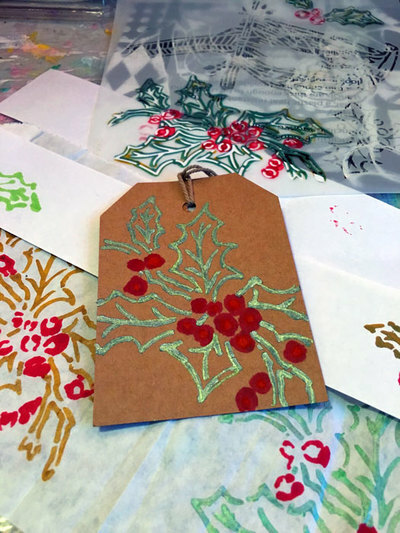 Lynda Shoup had a holiday gift tag and wrapping paper making party using my Christmas stencils - click to see all of the projects from her and her friends! 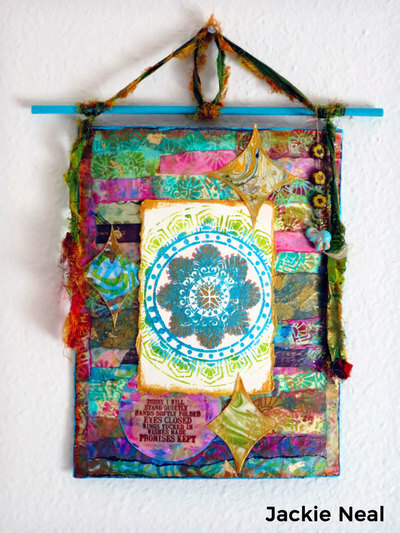 Jackie Neal used embellished trims, stencils, and sari yarn to make these fabulous mixed media gypsy prayer flags. Click for her post with lots of details and an overview of how she made the flags. 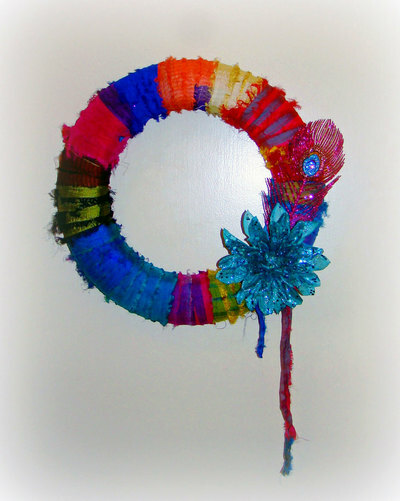 Sandee Setliff used lots of colorful sari ribbon to make this fabulous winter wreath for her front door. Click to see details! 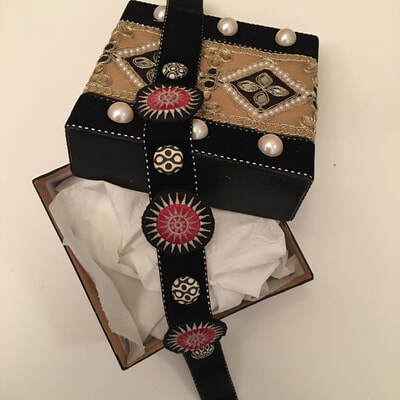 Linda Edkins Wyatt made this beautiful duo of projects - a lovely handmade choker using Hmong embroidered star patches, and a DIY gift box with embellished trim. Click to see her post with more photos and details! 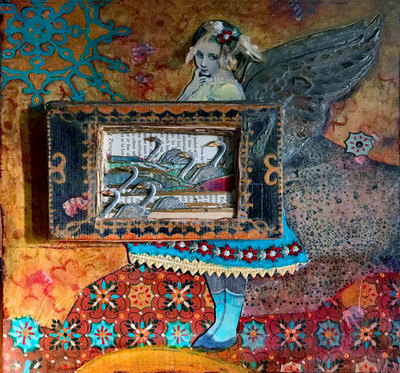 Jill McDowell used papers and embellished trims along with some of my stencil designs, collage cutouts, and lots of vintage buttons and pieces for this gorgeous piece of mixed media artwork! Click for her post with more photos and details. 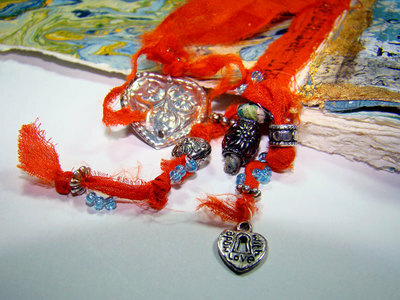 Check out this fabulous handmade reversible Boho necklace made by Lynda Shoup! 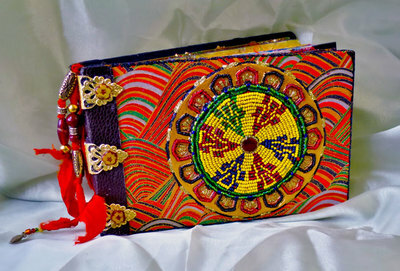 She used stencils, sari yarn, embellished trim, and papers to pull it all together. Click to see the post with a tutorial! 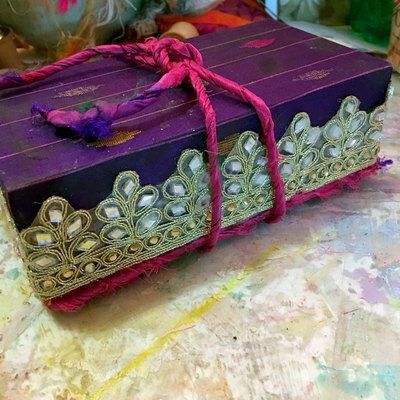 Linda Edkins Wyatt upcycled a shoe box into gorgeous art supply storage using embellished trims from India and a Turkmen jewelry part. Click for her blog post with more details and a tutorial! This gorgeous mixed media wall hanging by Jackie Neal uses my Art Deco Flower Medallion and Ornamental Peacock Feathers stencils as well as Czech glass beads, marbled papers, embossing powder, and washi tape from the shop. There's some sari yarn too! Click to see details of the project and read about Jackie's process. 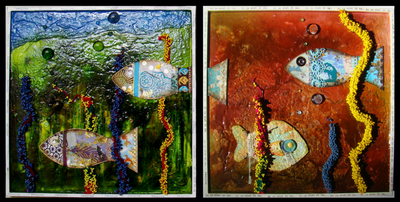 Sandee Setliff made this gorgeous pair of mixed media panels using boho collaged fish and beaded Kuchi trim. Click to see her post with more photos and details! Lynda Shoup made this fabulous upcycled phone box into a secret storage compartment. 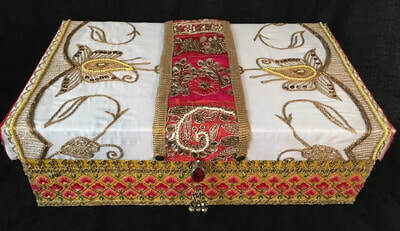 She used embellished trims, silk sari yarn, and sari scraps. Click for a tutorial! 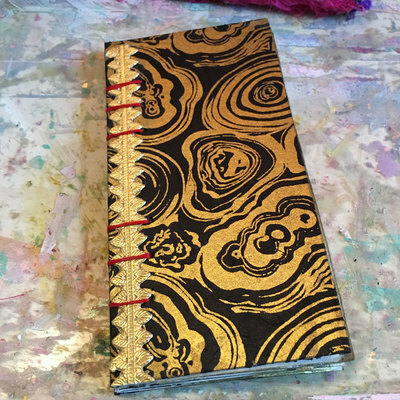 This fun little handmade art journal by Lynda Shoup is covered with Indian marbled paper from the Irresistible India Mixed Media Happy pack, as well as Dresden trim. Click to see more! 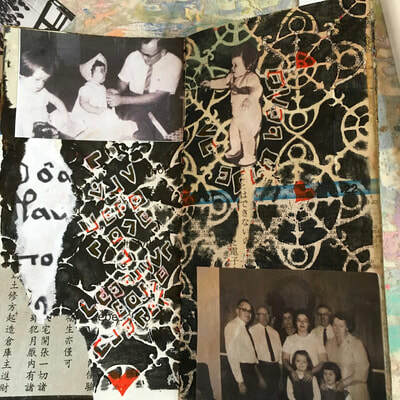 This spread from Lynda Shoup's mini handmade art journal features lots of stenciling, as well as photos and ephemera - including Chinese book text from the Exotic Orient Mixed Media Collage & Embellishment Pack. Click to see more spreads! 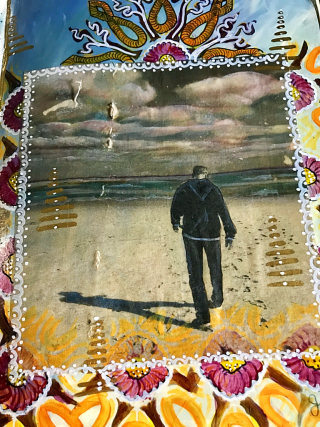 Jill McDowell made this art journal page using my Decorative Medallion stencil and a cool photo transfer technique using silk! Click to learn more about this page! 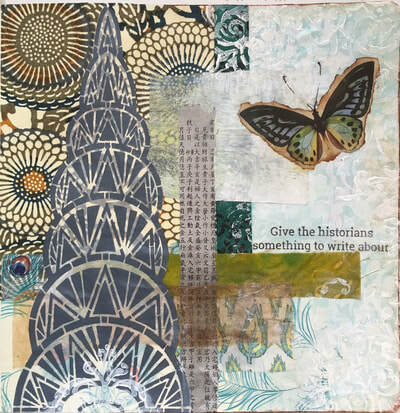 Linda Edkins Wyatt did this art journal page about hopes, dreams, and New York City with my Art Deco Borders stencil, a butterfly collage cutout, Chiyogami paper, and other papers from the shop. Click to learn more about her spread! 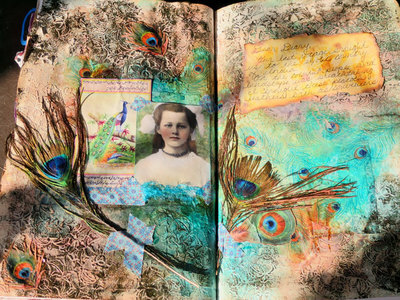 Jill McDowell used stencils and mark-making along with a cool photo transfer technique to make this stunning art journal spread. She also has an awesome tutorial, including instructions for transferring a photo onto vintage fabric! 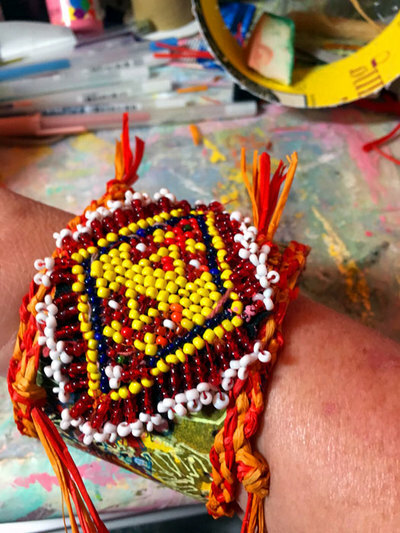 Lynda Shoup made an upcycled cuff using a Kuchi patch, stencils, and raffia. Click for her post with more photos and a tutorial! 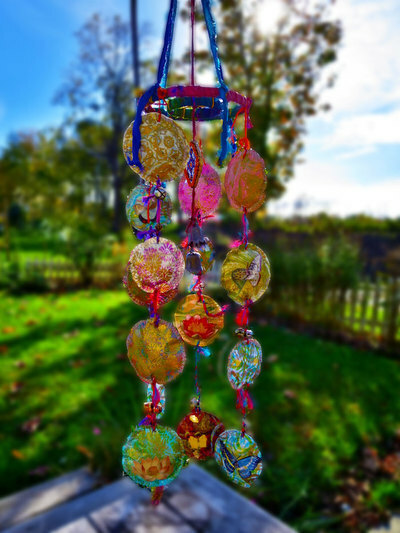 Jackie Neal used papers, stencils, sari yarn, and a beaded Kuchi patch to make these fabulous mixed media wind chimes! Click to see her blog post for more photos and info. 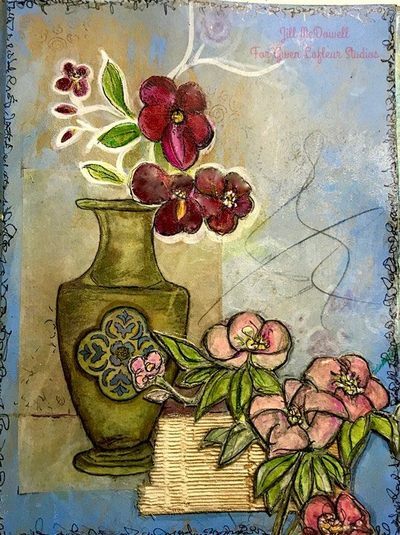 Sandee Setliff used washi tape, sari yarn, a mini woodblock stamp, and my Decorative 6-Petal Flower Screen stencil in this fabulous art journal spread! Click to see her post and process for making this page. 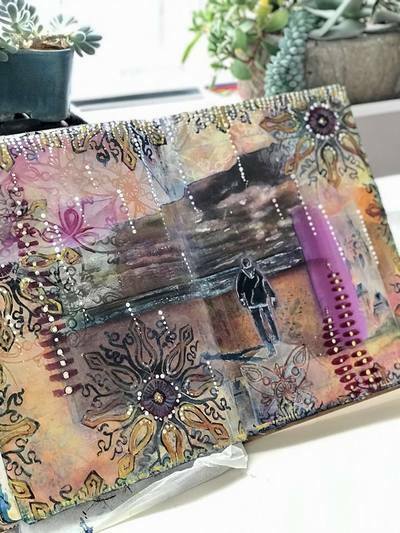 Jackie Neal made a gorgeous embellished art journal cover with Japanese paper, a Kuchi patch, stencils, Dresden trim, and more! Click for her tutorial! 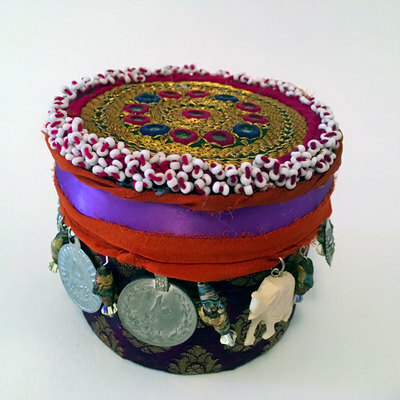 Linda Edkins Wyatt used a beaded Kuchi medallion along with sari yarn and some Turkmen jewelry parts to upcycle a lotion jar into a beautiful decorative storage piece! 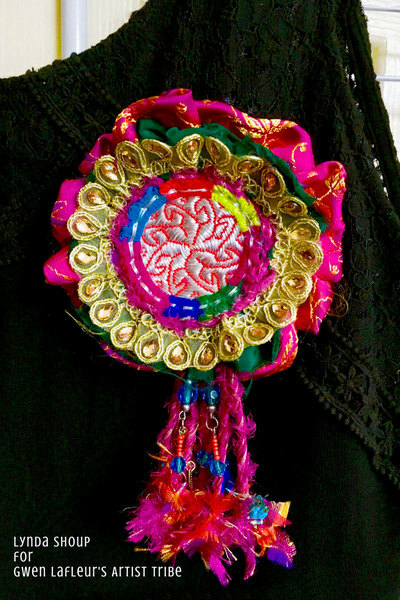 Lynda Shoup made this gorgeous brooch using an embroidered Kuchi patch, embellished trim, sari yarn, and some beads and fabric from her stash. Click to see her blog post with details on how she made it! 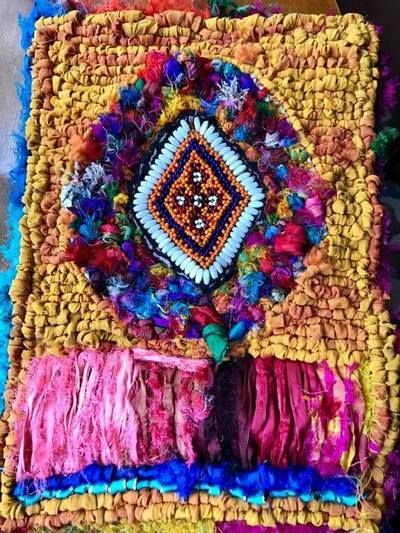 Jill McDowell made this AMAZING wall hanging using sari yarn, a Kuchi patch, and some Turkmen jewelry parts. Click to see her blog post with more photos and a tutorial! 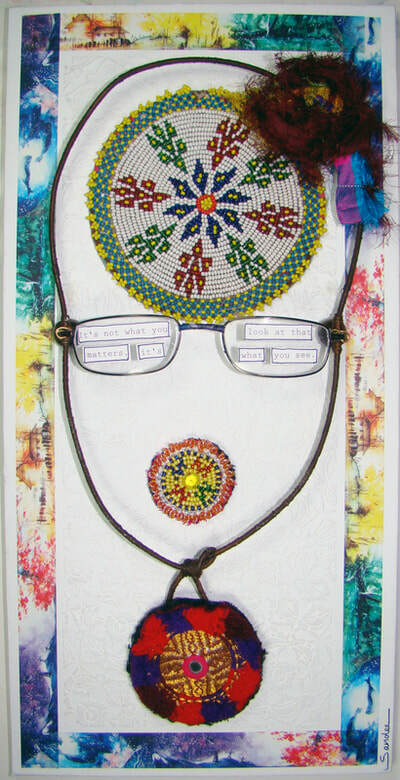 Sandee Setliff combined Kuchi patches with an old pair of glasses to make a fabulously creative mixed media portrait! Click to see her post and learn more about it. 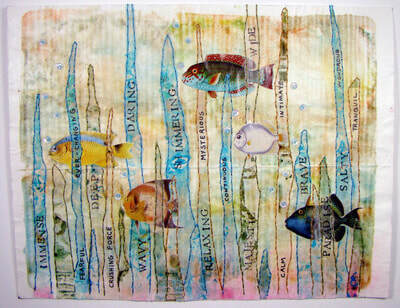 In this lovely art journal spread, Sandee Setliff showcases the Stupendous Sea Life collage cutouts. Click to see more! 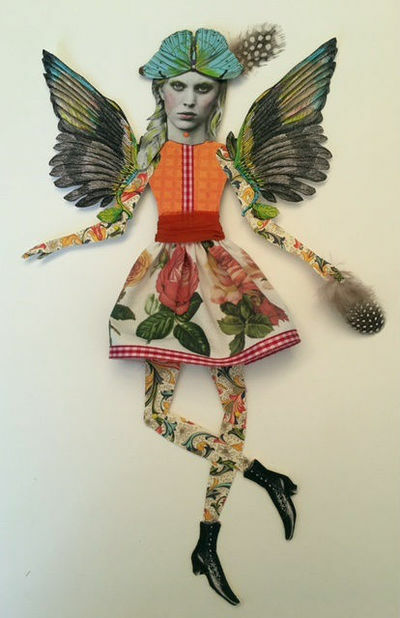 This modern paper doll by Linda Edkins Wyatt uses Florentine paper for the body, and collage cutouts for the wings, crown, and skirt. Click to see her tutorial for printing the collage sheets on fabric! 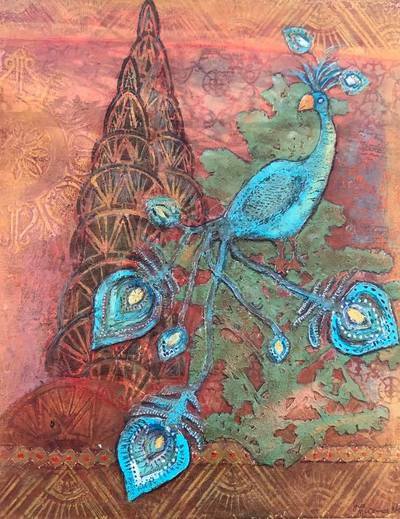 This beautiful mixed media panel by Jill McDowell uses my Ornamental Peacock Stencil, as well as several other designs from my other collections. Jackie Neal used my Decorative 6-Petal Flower stencil, Proud Peacocks collage cut-outs, Emerald Creek Embossing powder, and washi tape to make this beautiful art journal spread! Click to see more! 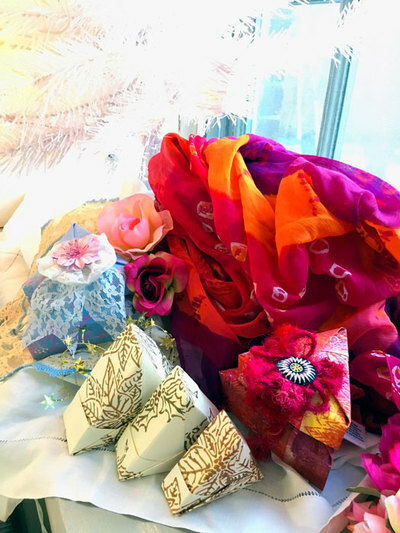 Click to see how Sandee Setliff used sari yarn, Turkmen jewelry parts, and marbled paper as she continues to work in her Khadi Papers art journal! 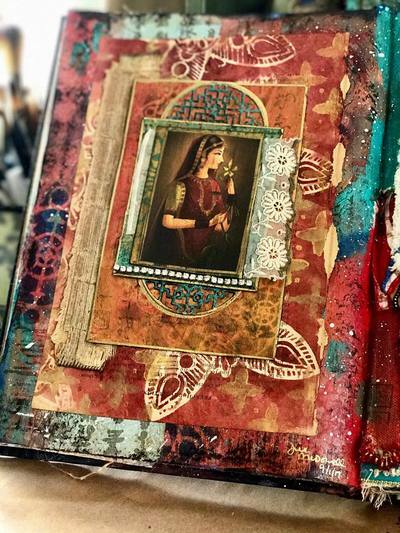 Jill McDowell is using stencils and downloadable collage cutouts in this gorgeous layered art journal page. Click to see her post with more photos and details! 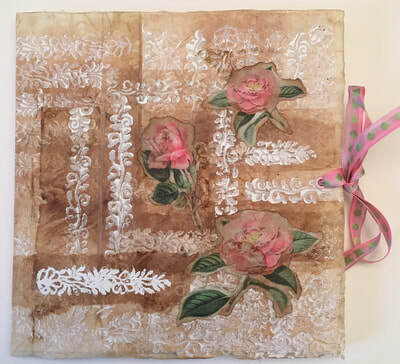 Beautiful art journal cover by Linda Edkins Wyatt using the Khadi Papers 8x8 journal, mini woodblock border stamps, and the Romantic Roses downloadable collage cutouts. 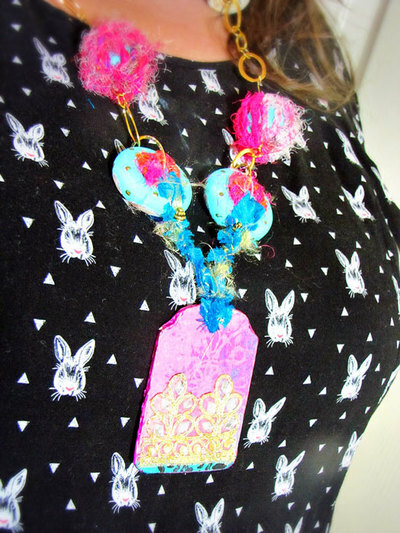 Click to see her post showing how she made this beautiful shabby chick project! 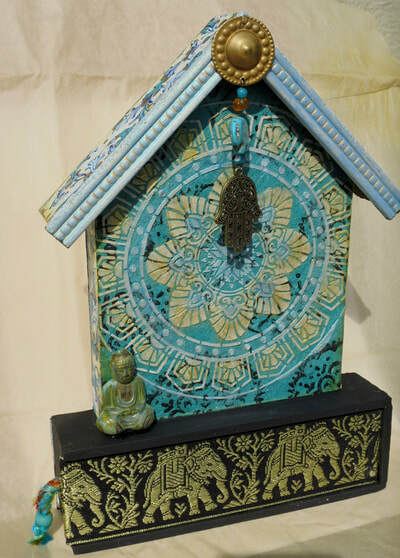 This beautiful sage shrine by Jackie Neal is a fabulous mixed media assemblage piece using stencils, bits and pieces from a collage & embellishment pack, and Turkmen jewelry parts. Click the photo to see her post with an overview of how she made it! 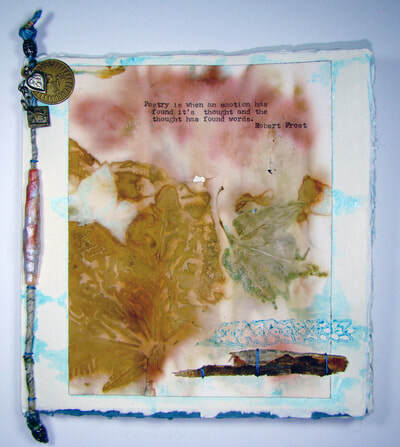 Sandee Setliff used the 8x8 Khadi Papers journal, Turkmen jewelry parts, newspaper yarn, and a mini woodblock stamp along with some nature printing to make this gorgeous art journal cover! Click to see and hear more from Sandee about her project. 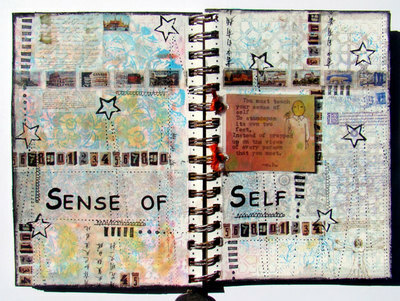 This beautiful art journal page from Jill McDowell is full of fun stenciling techniques! Check out her tutorial on her blog! 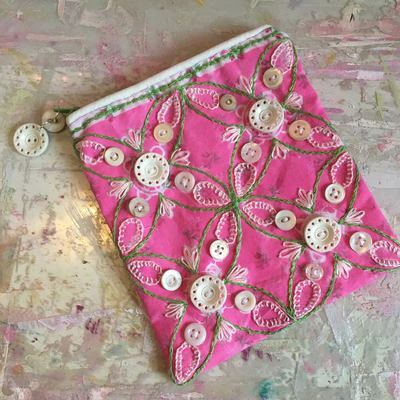 This beautiful handmade embroidered zipper pouch by Lynda Shoup uses my Ornamental Petals Screen stencil as an embroidery pattern. Click to see more! This gorgeous art journal page by Jill McDowell uses my Art Deco Flower Medallion stencil, Japanese Chiyogami papers, and Beautiful Butterflies printable collage images. Click to see Jill's tutorial! You can also follow The Artist Tribe on the Gwen Lafleur Studios Instagram account!